The Brazilian Symposium on Virtual Reality (SVR) is the premier conference on Virtual and Augmented reality in Brazil. Traditionally sponsored by the Brazilian Computer Society (SBC), SVR is in its 18th edition and has established itself as an international scientific forum for the exchange of experience and knowledge among researchers, professionals, practitioners, students and developers concerned with research and development of human-computer interfaces focused on Virtual, Augmented and Mixed Realities. This year, SVR will be held on June 21-24 at the UFRGS-Faurgs Events Center in Gramado in the Brazilian State of Rio Grande do Sul. High-quality original and innovative research papers as well as case studies and applications in all areas related to virtual reality (VR), including augmented reality (AR), mixed reality (MR) and 3D user interfaces are encouraged to be submittedk. 1) Research paper: the goal of this track is to present papers with original research describing results that contribute to advances in the state-of-the-art of VR-related topics. 2) Application / Case Studies: due to the growing maturity of the VR field, there are already AR/VR/MR applications in widespread use across many fields. This track provides the ideal opportunity to present and discuss applications. The goal is to present applications that build upon existing ideas and established techniques to solve a problem in a novel way. 3) Review papers: the goal of this track is to present papers that explore the state of the art in VR/AR/MR. A review paper should provide an updated and extensive overview of the kind of issues that are addressed in the literature on a topic related to VR, the main theories, findings, conclusions, and the most important challenges for the future. After a rigorous double-blinded peer-review process, the selected papers will be presented in the symposium technical sessions and published in the conference proceedings and submitted to the IEEE Digital Library. Outstanding papers submitted in English will be invited to submit extended versions to a special session in the Computer Animation and Virtual Worlds Journal (Wiley) and in the SBC Journal on Interactive Systems. 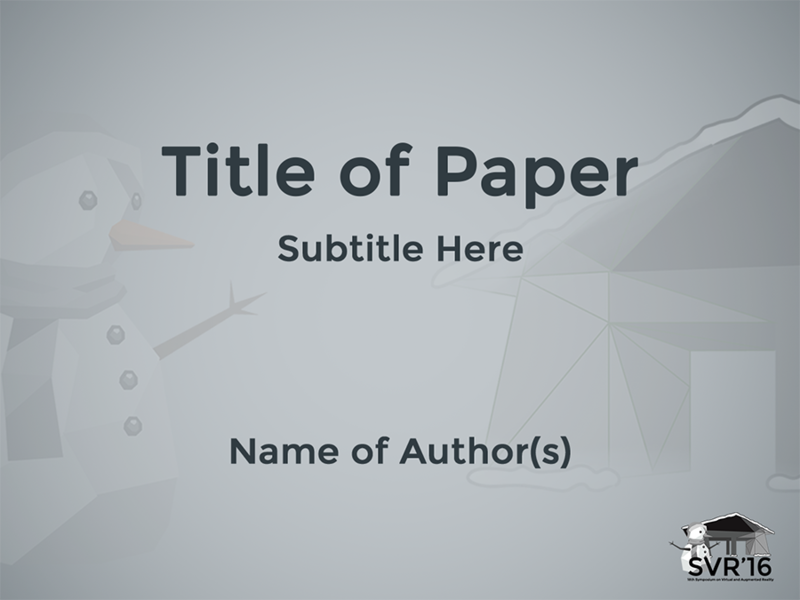 Full Papers: Full papers should contain between 6 and 10 pages and present a level of contribution commensurate with its length. Research full papers should present consolidated research ideas with strong evaluation evidence of the results. Application and case study full papers should report on mature applications which have been thoroughly tested with evidence of the effectiveness of the tool. All review papers are expected to be submitted as full papers. Exceptionally, review papers may contain up to 12 pages. Short papers: Short papers should contain between 3 and 5 pages and should present small, but not low quality, contributions. Research short papers may report initial ideas and preliminary evaluations of ongoing research, or complete presentation and evaluation of a small research problem. Application and case study short papers may present an ongoing effort into an applied problem in VR, or the complete report of an application with limited scope. No review papers should be submitted in short form. As an international forum in virtual reality which welcomes a worldwide audience, the official language of SVR 2016 will be English. Authors are strongly encouraged to submit papers in English and use translation services if needed. Papers written in Portuguese will be accepted and reviewed with the same process as English-language papers. Special Portuguese-only sessions will be offered during SVR for the presentation of Portuguese-language papers. It is the goal of SVR to have an increasing percentage of the conference papers written in English. Papers must be formatted using the IEEE guidelines - US Letter size - and should be written preferably in English or Portuguese. Papers in Portuguese must also have a title and abstract in English, with corrected grammar, preferably written or translated by a native English speaker. Authors names and affiliations should be removed from the submitted manuscript to guarantee a blind review. The papers will be submitted to the JEMS system. The final version of your paper must be submitted with the SBC Copyright Form. The template has the Copyright Form written in english and in portuguese. It is not necessary to sign both. Authors must choose between one of the two no matter the language in which the draft was written. CPS camera-ready submissions: In June, corresponding authors of all accepted full and short papers will be contacted by CPS to provide their final version of the paper to be published electronically by the CPS. To speed up the process, please prepare your PDF in A4 size following this template here. Clique aqui para baixar template.